Two old forks that are puzzling me ??? These two forks have got me puzzled , but I am still learning , I have now got all the books and recognising things slowly but struggling with these two … The forks look interesting though ? Anybody throw some ideas on them please ? The larger plain one has marks ’ W H & S, b ?, p? , MP/B ’ , but on the front it has ’ CITY OF LONDON SS ’ , which is a ship that sank in 1881 with the loss of 41 lives . The patterned one has ’ F N & S , ? , ? ,? , A ’ , and what looks like the letters ’ J C ’ on the front . I was going to sling them but decided to look more closely - you never know ? I also have some plated spoons with the word ’ ORUBA ’ , and ’ W & H inside a triangular flag ’ , reference to another Ship I think ? Both of the forks are silver plated. The larger plain one is made by William Hutton & Sons, in Sheffield. They started using this plate mark in 1849. The patterned fork is lilly pattern, but I do not recognise the makers mark. I will have a look over the weekend and see what I can find for you. It is certainly Victorian plate though, the marks after the FN & S are the gothic letters EP. The JC initials would probably be those of the original owner. 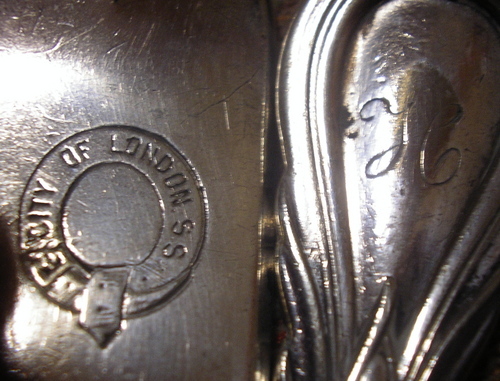 As for the plated spoons, the W & H inside a flag is the makers mark for Walker & Hall, which they started using in 1861. The term Oruba is something I haven’t seen on plate before. It could be to do with the RMS Oruba, or could be a fairly random plate mark. Tried to edit but got in a mess ! Thanks Daniel , I thought they were plated but have learnt something new - Gothic letters after F N & S = E P , no wonder Im confused ! So the plain one could have belonged to the SS City of London ? This ship has an interesting history . I have since found Oruba spoons on ebay , the Oruba was a dummy battleship and the sellers claim the ship as previous owners with the same markings ( but then they would ) !